When you are looking to buy an inflatable hot tub, you will almost certainly have a lot of questions or maybe concerns. Here are the questions which are most frequently asked by those looking to buy their first inflatable hot tub. Occasionally, we link to our own articles which go into more detail, in case you need a more comprehensive understanding. Costs can vary, depending on a variety of factors. These include how big your hot tub is, how warm or cold the outside air is, how hot you keep the water, how long you run the massage system for, and most importantly how many times you use your hot tub every week. As a guide, though, let’s take the Lay-Z Spa Paris, which is suitable for 4 adults and has 87 air jets. If you use the Paris 5-6 times a week, for around 30 minutes each time, and keep the cover and lid on while you are not using it, then it would cost around $20-$30 a week. You might also want to check out this useful article on How To Save Energy With Your Hot Tub. What Extras Do I Need To Buy? Your inflatable hot tub will come with everything you need to set it up and have it running in very little time. However, we strongly recommend that you buy some water sanitizer at the same time as you buy your hot tub. You’re going to fill your hot tub with sparkling clean water, and adding sanitizer from the very start will help keep the water – and the hot tub – clean and hygienic. If you’re unsure, or even concerned, about the chemicals you need to use with your inflatable hot tub, we have an easy-to-follow article which tells you everything you need to know in simple English (you don’t need any science knowledge!) You can read it here: Your Guide To Inflatable Hot Tub Chemicals. You might decide after a while that you want to add some accessories to your hot tub, such as headrests, steps, a floating Bluetooth speaker, and so on. There’s a wide range of accessories you can buy that are available online. Some of these are generic, while others are made by inflatable hot tub companies and designed to fit their specific models. It’s always worth shopping around online, as you do not necessarily need to buy accessories from the company that make your hot tub. Just be sure they will fit your model. If you are interested in looking out for quality accessories, we have a guide you might enjoy reading: Our 9 Favorite Inflatable Hot Tub Accessories (which opens in a new tab). Do I Need To Leave The Heater Running All the Time Or Should I Just Turn It On Before I Use It? We believe it’s best to leave the heater running if you are going to use your inflatable hot tub regularly – say 4 or 5 times a week. Doing this will keep the water at the optimum temperature, so you don’t have to keep heating up cool water. In the end, this will save you money and time. However, if you’re going to use your hot tub once or twice a week, then we suggest you heat up the water before you get in. How Much Does A Good Inflatable Hot Tub Cost? There’s a wide variety of models available, as you’ll see from our reviews. These range in price from around $300 up to a top-of-the-range model costing well over a thousand dollars. You might think that a hot tub costing a thousand bucks is going to be much better than one costing a few hundred. But that’s not always the case! There are a number of factors involved in the price of each model. These include the size of the hot tub, the number and power of the massage bubble jets, the power of the heater, the hot tub’s construction, along with the number of accessories which come as part of the package, such as hot tub cover, padded seats, and so on. The truth is, that design and technology are so advanced these days, that an inflatable hot tub that costs a few hundred dollars will be extremely well-made, with a good to excellent massage system, and a few extras. Budget models costing up to $500. Medium-Price models which cost from $500-$1,000. Luxury models which cost over $1,000. What Size Inflatable Hot Tub Should I Buy? Put simply, the bigger your hot tub is, the more people you’ll fit in it. But big is not necessarily better. It really depends on how many people you think are going to regularly use the hot tub. Larger inflatable hot tubs are generally more expensive, and they take longer to fill up with water, and cost more to heat. And – although it might be nice to have lots of room to stretch out in – if it’s going to be only you who is going to be using the hot tub, for example, then you’ll be paying a lot in heating costs to keep an over-large inflatable hot tub running. Therefore, you’d be better off buying a 2-person or smaller 4-person inflatable spa. On the other hand, you might want to use your inflatable hot tub for water aerobics, in which case a smaller hot tub might not be big enough. Therefore, a larger 4-person portable spa would be a better choice. As you can see, it is important to carefully think about how many adults are going to use the hot tub regularly, and what it is going to be used for. It’s also important that you don’t get misled by how many people the inflatable hot tub companies say will fit in their tubs! That’s because they are usually talking about how many adults can sit side-by-side in the hot tub, all close together, without stretching out. That’s why, in all of our reviews, we tell you how many adults can stretch out in the hot tub. So when a manufacturer says it’s a 4-person hot tub, but we know it’s better to see it as a 2-person hot tub, we’ll tell you that capacity! How Much Space Does An Inflatable Hot Tub Take Up? When you think about the size of your portable hot tub, remember you will need some space around it so that you can get in and out easily. We recommend a clearance area of 24″ (2 feet) all around the hot tub – preferably more if you have the room. This is for ease of access, to fit the cover on, for cleaning, etc. One of the smallest quality models is the Lay-Z-Spa Miami, which measures 71″ in diameter. Therefore, for the Miami, adding on 2 feet all around, you need a space measuring 10 feet across. You can push your hot tub into a corner or up against a wall. But remember that once it is full, it weighs a couple of thousand pounds. So if you needed to get to that side of your hot tub, you would have to drain it before you could move it. You would then have to refill it, and heat the water up all over again. So if you can, leave access. The great thing about inflatable hot tubs is that they are portable, so you can set yours up in any suitable spot. Just make sure the ground is level, and that you have enough space around it for access. Many models also have grab handles. 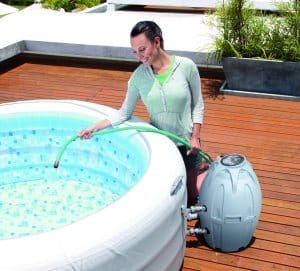 So you can inflate your portable hot tub in a large open space and then lift it and put it into position once it is inflated. Can I Set Up My Inflatable Hot Tub Indoors? Yes. As long as you choose a room with a solid floor, usually a room on your ground floor, as when it is filled your hot tub will be very heavy (see the next question for more on this point). Make sure the room is well-ventilated, as well, as your hot tub does give off steam which will condense. Also, make sure to place your portable hot tub away from electrical sockets and valuable items, just in case some water accidentally splashes, or there are drips when you get out. How Much Does An Inflatable Hot Tub Weigh? This can be a critical question if you are thinking of putting your inflatable spa on a deck or maybe even inside or in a garden building. When a medium-size inflatable hot tub such as the Coleman Lay-Z Spa is filled with water, it weighs almost 2,200 lbs. You then have to add in the combined weight of the people who get into the tub – if it’s 2 adults, that can add another 300 lbs or. So the combined weight could be 2,500 lbs. That’s the equivalent of a U-Haul trailer. So before you decide where you are going to site your inflatable hot tub, make sure any floor, decking, or base is strong enough to fully and safely support a weight that can, with large hot tubs, be the equivalent of a family car. Does An Inflatable Hot Tub Run Off A Household Electric Supply? Inflatable hot tubs are inflated, run, and heated by electricity. They come with a long cable which has a normal household plug on it, that you simply plug in to an everyday household socket. So there’s no need for any special wiring or paying an electrician. You just plug it in yourself and away it goes. Check that the electrical lead is long enough for you to site your hot tub where you choose, as we strongly recommend you do not use an extension cable. Is It Easy Set Up An Inflatable Hot Tub? It really is simple to get your inflatable hot tub up and running in no time at all. It should take around 10-15 minutes to lay out your hot tub on your chosen site, plug it in and inflate it, ready to fill with water. It will take another 30 minutes to an hour to fill your portable hot tub with water, and then between 12-24 hours to heat the water to the industry-standard maximum temperature of 104F. The actual time depends on the size of your tub, as the bigger it is, the longer it takes to heat. One other factor is how hot or cold the day is, as well. The hotter the day, the less time it will take for the water to warm up. Some people fill their inflatable hot tub with warm or even hot water, to give it a head start, so it takes less time to reach the required temperature. It is perfectly OK to do this. It’s also a great idea to site your inflatable hot tub near a wind break, such as a fence. This helps reduce wind exposure, which means your hot tub will retain more heat, which in turn helps reduce your running costs. Can Children Use An Inflatable Hot Tub? No child under the age of 5 should ever be allowed into any sort of hot tub. Even for a minute or so. That’s because their skin is too delicate for the hot water (you wouldn’t think of putting them in a bath that’s 104F). Also, their bodies are unable to regulate their inner temperatures at such a young age, and they can quickly overheat. This can be extremely dangerous. For children over 5, the general rule is that they must be tall enough to stand up in the hot tub and have their head clear above the water. We believe the most important article we have on our website is Keeping Children Safe In Your Inflatable Hot Tub. If you have children and you are thinking of allowing them to use the hot tub, please read our article first. How Loud Is The Massage System In An Inflatable Hot Tub? For your reference, 60dB is the same as a normal conversation between two people who are standing a few feet apart; 72dB is the same as a vacuum cleaner. How Much Maintenance Does An Inflatable Hot Tub Require? Not as much as you might think. Looking after your inflatable hot tub is quite easy. 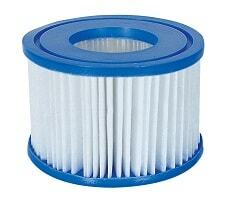 Simply wipe the inside of the tub at the water level with a damp sponge, every time you use it. If you use a cleaner to get rid of tougher spots, never use an everyday household cleaner, as this might damage the water filter and pump. Instead, get hold of an inflatable hot tub surface cleaner from a site such as Amazon. When you decide to drain your hot tub, or take it down for the winter, you will need to give it a good clean before you put it away and then dry it out. For more about this topic, read our article How To Clean Your Inflatable Hot Tub. How Do I Keep The Water Clean? Inflatable hot tubs come with a water filter system, so you will need to change the filter every few months, although this depends on how often you use your hot tub. You will also need a supply of chemicals which you add to the water, to prevent bacteria and algae from flourishing. While your portable hot tub is not in use, you simply put a cover over it, to keep the water clean. If your hot tub does not come with a cover provided – or the cover gets damaged – it is easy enough to buy a cover which fits your model. For more detailed information about this important topic, please read our article How To Keep The Water Clean In Your Inflatable Hot Tub. What Do I Do If My Inflatable Hot Tub Gets A Puncture? As long as you’re careful, this shouldn’t happen, as inflatable hot tubs are made of very strong, multi-layer material. But with small children around, however, or simply an unfortunate accident with a decking nail or protruding branch, it is possible your inflatable hot tub might get a puncture and you’ll need to repair it. If it does happen, you can use the repair kit which comes with your hot tub. These are simple to use and very effective. Can I Use My Inflatable Hot Tub All Year Round? Possibly. It depends on exactly where you live, and how cold the winters are. For the majority of inflatable hot tubs, the bottom line is that you should not use your inflatable hot tub in temperatures below 40F. That’s because the PVC material the hot tub is made of becomes brittle in such cold weather and will quickly perish. If you are lucky enough to live in warmer climates, however, your inflatable hot tub is suitable all year round. You will also be able to use your inflatable hot tub if you site it indoors – and as long as you follow the advice we have given above. There are a handful of portable spas that are built to be used year-round. 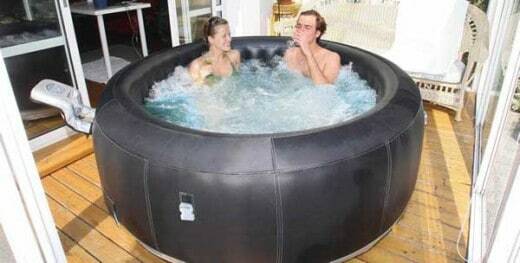 We have written an article on these, which you might find useful: 4 Season Inflatable Hot Tubs. Is It Safe To Use An Inflatable Hot Tub If I Have A Medical Condition? Generally, it is completely safe, although this does depend on your specific condition. Check out our article on the very real benefits to you health and medical conditions by clicking this link: The Health Benefits of Hot Tubs. If you do have any concerns about using an inflatable hot tub, please always consult a medical practitioner for advice. Is An Inflatable Hot Tub Comfortable And Easy To Get In And Out Of? While some inflatable hot tubs have internal seats, most have a cushioned floor. This floor is comfortable and suitable for periods of extended use. If you prefer, though, you can buy padded hot tub seat quite reasonably on sites such as Amazon. As for support while you get in and out, every quality inflatable hot tub has an internal construction that means the walls are super-strong. So much so, that adults can even sit on the sides and the walls will not give way or even buckle. This means they are definitely strong enough to support you as you get in and out of the hot tub. If you suffer from arthritis or you struggle with your mobility, and would like 100% peace of mind, then you can purchase an inflatable hot tub step from Amazon. 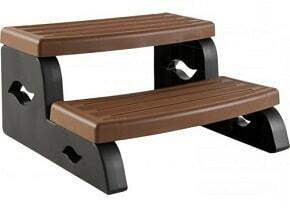 These provide extra assistance and support when entering and exiting the spa. We hope these FAQs have been useful, and they have answered your questions. Thanks for reading!